Today is November 30th. The very last day of the month. The very last day of National Blog Posting Month. 2010 is amazingly the 4th year I have done NaBloPoMo. The 4th year I have successfully posted 30 posts in 30 days. Forget about 4 successful NaBloPoMos... I can't believe I've been blogging for 4 years!!!! I was curious about when exactly I started doing NaBloPoMo so I went back to my very first NaBloPoMo titled post. It was fun to look back on a bit of me in 2007. Do you want to know my favorite part of looking at that post though? Seeing who commented. There were a couple random people who stopped by that first post via the "NaBloPoMo Randomizer"... but 4 years ago I was exchanging comments with Natalie, Christina, Laura and Kimberly. I looked at a couple of other November 2007 posts and I found Carrie, Kim, Jenty, Mary (who now has a different private blog), Carolyn, Alison, and Lindy. I want to say I was surprised... but I guess I really wasn't. All of these women have been with my blog since the beginning (or very close). I still read all of their blogs and (I think) they still all read mine. I have them all among my list of Facebook friends. They've watched Zoe growing up for more than 4 years. They were here when Ana was born and she's suddenly almost 2 1/2! And, at the same time, I've been watching their children grow... and have been reading stories about the different twists and turns their lives have taken. A large part of why I blog is because of all of you out there reading. I haven't been getting very many blog comments lately (what's up with that people?). I have been getting comments on Facebook and Twitter. Random messages back and forth. I know that I have been commenting less on blogs too... so I can't say I really blame anyone. Just in the last week I've been trying to spend less time reading in Google Reader and more time using the little "next" button I added to my toolbar. I love Reader... but I've been realizing how much I've been missing being on the actual blogs. It's been making me comment more. It's been making me connect more. And really.... that's why I blog. 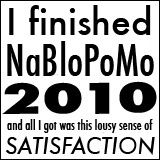 Thanks everyone for sticking with me through NaBloPoMo 2010!!!! !